The January transfer window is open and Football League fans will have a wishlist of players that they would love at their club. Most will probably have a list they would like to leave too. I think supporters see it as a chance to get that morale boost heading into the second half of the season and that doesn't necessarily have to be a big money signing. Let's be honest, most clubs in Leagues One and Two don't have the budget to go and spend money on a transfer fee or high wages so instead a boost might be making a loan permanent, extending a current loan that was due to expire or extending a contract of a current player who looked destined to leave. What's it like for a player? From a player's point of view the January window can be a bit of an unsettling period. There is the calm before the storm of November and December where everyone is settled and players and agents are just concentrating on football. Then January comes along and anything can happen. 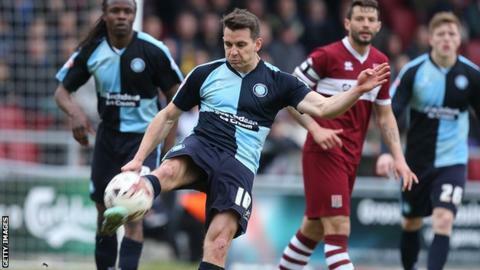 Those who are most affected in League Two would be the players whose contracts are coming into their last six months. Clubs will be either trying to tie them to a new contract or will be trying to raise a transfer fee before it's too late and their asset walks away for nothing at the end of the campaign. Most of the January window centres around these players from my experience. We have lost a number of good players at Wycombe over the years during this period and who can blame either party? The player wants to better himself by playing in a higher league and earning more money, and as I stated above, the club would loathe losing any player that they wanted to keep for nothing. I have seen player's heads turned during both this window and towards the end of the summer window. Their main focus has been about who is interested in them and whether they will get their move, it occupies their thoughts. At this point the selling club is doing the right thing by allowing the player to move on. It's in everyone's best interests. After 12 years at Wycombe I obviously haven't ever had any experience of a January transfer myself, and haven't ever wanted or tried to push through a transfer. However, I have known players at other clubs who have had to push things through to get their deal done. Sometimes they have felt that the offer is too good to miss out on and have done whatever is necessary to get it over the line - refusing to play or avoiding being cup tied, this is the business aspect of the sport we are in. We might not always agree with it but each individual does what he sees as best for himself and his family. Love it or hate it the window is upon us and I'm sure as the days count down it will become more and more exciting, just like it always does.